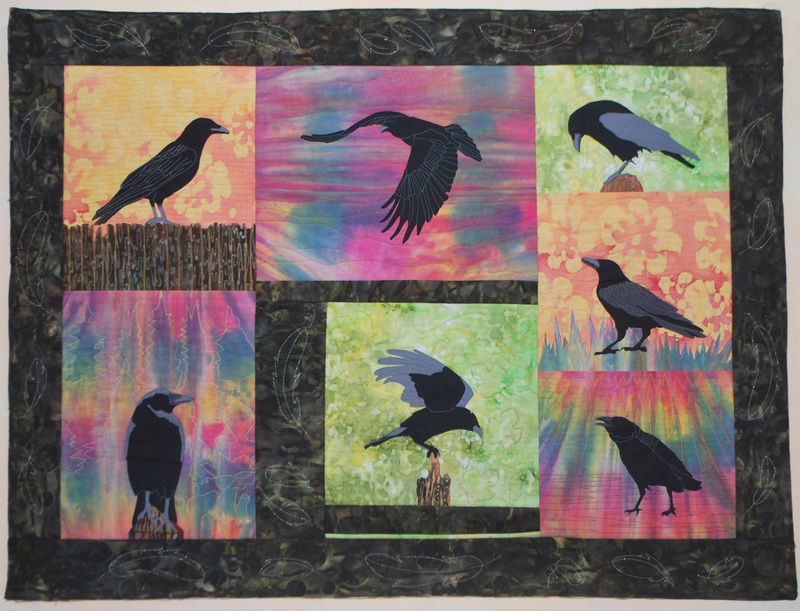 The Crows quilt is fused raw edge applique, with a little thread painting, and drawing with machine stitching. Most of the quilting was suggested by the prints I used for the backgrounds. I explain in the pattern the different kinds of drawing lines I used for background quilting. If you printed out the whole PDF Crows pattern, it would be seventeen 8 1/2" x 11" pages, but you only need to print the seven Crow applique drawings pages and the one page of feathers drawings for the border. Leave the rest of the pattern to read and refer to on your computer. When you cut up your patterns to make the appliques for the details, you always have a complete set of drawings in your computer. I foiled the gremlins once again. (Don't you have gremlins taking your stuff at your house, too?) Another advantage to a PDF pattern is that you don't have to wait longer than 24 hours to get your pattern. When you purchase a PDF pattern, the location for the download will be emailed to you within 24 hours. I always assume that you don't know how to do any of the techniques needed to make up one of my patterns. The printed pattern also has 17 pages. In the printed version of the Crows the few colored detail photos and the croquis (croak-ees, small pictures next to the line drawings) appear in grayscale. This is a normal pattern: colored cover, including three color close up photos on the reverse side of the cover, and the rest is black/white and gray printed on 8 1/2" x 11" paper. We have How to Applique videos if you learn visually. Watch our designer, Debora Konchinsky take you through all the steps to make a Critter Pattern Works quilt. The second one shows how to raw edge stitch. This quilt was nade by cheryl Brimmer from WI. Printed pattern or PDF pattern?